Using three scenarios that could stand alone as their own short film, Israeli filmmaker Samuel Maoz (Lebanon) tells an epic story of an emotionally drained father and mother (Lior Ashkenazi and Sarah Adler), and their soldier son Jonathan (Yonathan Shiray) who may or may not be alive. Foxtrot initially proposes itself as a movie about grieving; its importance, the support from loved ones, and the arrogance that follows when the process isn’t moving fast enough. It’s a film filled with geometric design, further enforcing the theme of completion. Maoz then relocates and zones in on Jonathan and the struggle he endures while manning an undisclosed check point. It’s a routine that’s incessant in its monotony and attentiveness. Much like the aforementioned dance, Jonathan’s living arrangement also plays as a reflection of what he’s experiencing internally. He’s literally sinking around his surroundings. He knows what’s coming, but he also can’t stop the inevitable. He has no choice but to, yes, stay on guard. It would be a shame to spoil anything about Foxtrot’s final act, but it’s ability to keep its concerned audience intrigued through to its final frame is miraculous. 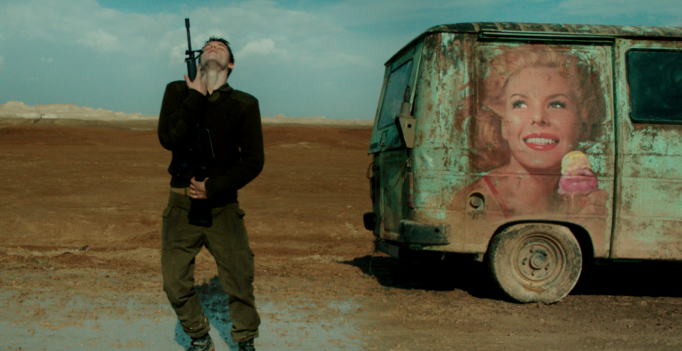 Foxtrot can be an overwhelming watch, but only because Samuel Maoz coats his gripping story in profound symbolism and symmetry. A second viewing may be required to catch unseen subtleties. That’s okay though considering how fulfilling this terrific movie is the first time around. I look forward to revisiting Foxtrot; perhaps on a year-end top ten list.